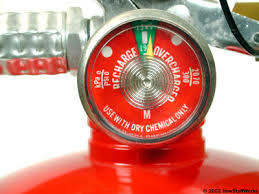 Pressure Gauge: is a quick visual reference that the extinguisher is fully pressure charged and ready for use. Most have a yellow or colored arrow pointing to a “full” or “green” charge area. Monthly inspections should include verifying that the gauge window is free and clear of moisture, that the arrow is pointing to the “charged” area and that the gauge is not bent, cracked or broken in any way. Pressure Gauge is a quick visual reference that the extinguisher is fully pressure charged and ready for use. Most have a yellow or colored arrow pointing to a “full” or “green” charge area. Monthly inspections should include verifying that the gauge window is free and clear of moisture, that the arrow is pointing to the “charged” area and that the gauge is not bent, cracked or broken in any way.